Once your children are done with braces, you may think that you don’t need to do anything else to ensure that they have straight smiles. Unfortunately, this is rarely the case. Most people will need to wear a retainer after they are finished with braces and some will need to wear more involved dental devices. Why is it necessary to wear a retainer? The most common question most people have about retainers is why they are necessary in the first place. Your child just spent two years or more (on average) wearing braces – wasn’t that enough? In many cases, no. The teeth can begin shifting back into their original positions after the braces are removed. This won’t happen right away, but it can become very obvious in a few years. In fact, if your child doesn’t wear the retainer as instructed, there is a 99 percent chance that the teeth will shift out of position, if not return to their original position. 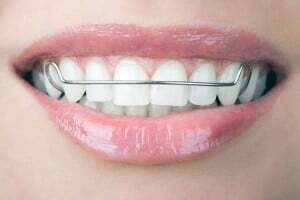 The shifting will be more likely with children who have had braces since their bodies will continue to grow and change. However, even adults who get braces can experience some shifting of the teeth after the braces are removed and may have to wear a retainer to prevent it. How long is it necessary to wear the retainer? Every case is different. People who are experiencing bigger dental issues may have to wear a retainer longer. However, most people will only have to wear a retainer for about six months after the braces are removed. In most cases, the dentist will instruct the patient to wear the retainer every day. Most people wear the retainer over night, but some may be asked to wear it all the time, depending on the individual circumstances. Some will be given a permanent retainer that is attached to the back of the teeth. This is typically a small bar attached to the teeth with small dots, and it prevents the teeth from moving. What does the retainer look like? The traditional retainer is modeled to look like the top of your mouth. It not only fits into the grooves on the roof of your mouth, but it is also shaped to mimic that shape so that it doesn’t intrude too much into the functioning of your tongue and mouth. The piece that fits against the top of the mouth is made of a hard plastic, and a metal bar that fits across the front teeth sticks out from it. Two other metal pieces near the back hook around two molars to anchor the retainer. This traditional design comes in many colors, but the most popular are pink and clear. The retainer is also removable to make for easy cleaning. Does it hurt to wear a retainer? Your dentist should customize the retainer to your mouth or your child’s mouth. Therefore, it should fit snugly and comfortably against the roof of the mouth and around the teeth. Some people report discomfort when they have not worn the retainer as instructed. That’s because the teeth have begun to shift out of place and the retainer is pulling them back into position. A sure sign that this is happening is if the retainer is snug. It is important to make an appointment with the dentist, who will determine if continued use of the retainer is enough to correct the problem or if other dental interventions are necessary. Working with an experienced dentist who makes you and your child comfortable is key to successful treatment. You will be able to create a successful plan and feel good about your working relationship.